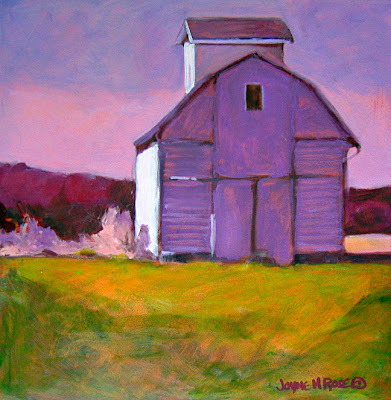 Farm on Sink Hollow Road, 12" x 12"
Barn on Cedar St., 12" x 12"
Thank goodness prom season and Mother's Day is over. It's hard to concentrate on painting when the restaurant is so crazy. I finished up my barn from last week and started on another one, same size and medium, today. 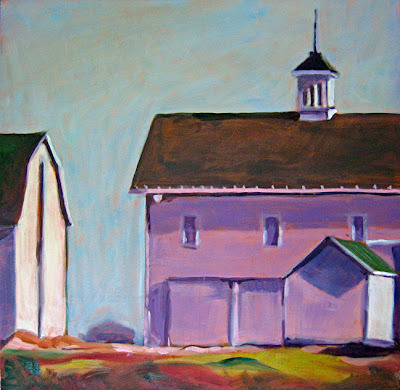 My picture (2nd one) for this finished barn is a bit more muted than the actual painting, but that's the breaks! The second one just needs another hour of work, but I'll probably have to wait another week to finish it because we have b&b guests most of the week. My frustration level is so high right now, it's unbelievable. I am enjoying the barns, although working this small is not natural for me. I plan on doing some larger ones soon. While working bigger, I can just throw the paint around in a more relaxed way. Working small makes me tense up a bit. Heh. That's what I want...more tension!